The Soviet defenders in the Kursk salient had over 1.3 million men, 3500 tanks and 28,000 pieces of artillery and anti-tank guns plus more in reserve. They also built anti-tank strongpoints, bunkers and ditches and laid hundreds of thousands of mines. There are examples of most of the tanks that fought at Kursk on display at The Tank Museum. This article will take a look at some of the Soviet tanks used in the battle. 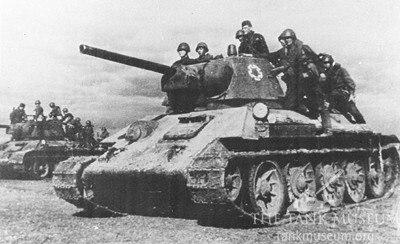 T-34 Model 1943s carrying infantry. The German invasion of June 1941 caused massive disruption to the Soviet Union. Entire factories and their workforces had been moved hundreds of miles east to escape capture. The need to both replace the huge manpower and equipment losses of the early months of the war and expand the Red Army at the same time led to an emphasis on reducing the number of different vehicles in production and ensuring manufacture of those that remained was made as quick and cheap as possible. 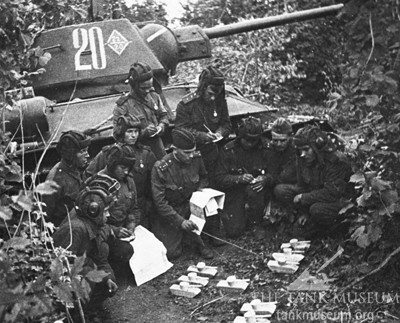 T-34 commanders are briefed by their Company Commander. The least common Soviet tank at Kursk was the KV-1 heavy tank. 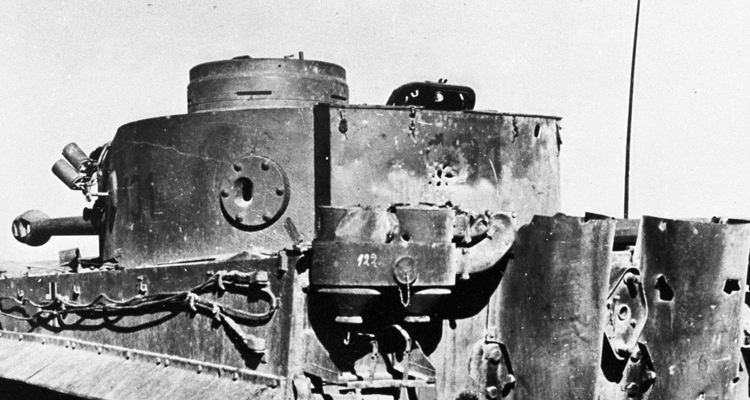 This weighed around 48 tons and was very heavily armoured, but it had the same engine and gun as the 31 ton T-34. As a result it was slower and far less mobile, but offered no advantages in firepower. By 1943 new German anti-tank guns could defeat its armour, and it was clear that its day had passed. The 205 used at Kursk were amongst the last to see combat. The KV-1 chassis was also used for the SU-152 assault gun, a turretless vehicle armed with a 152mm artillery piece. Two other assault guns were used in small numbers at Kursk. 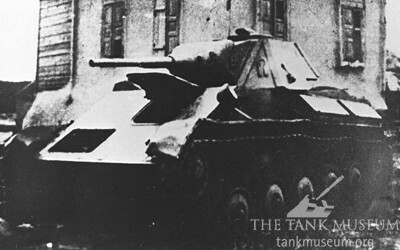 The lightest was the SU-76, based on the T-70 tank chassis. This was open topped and armed with a 76.2mm field gun. 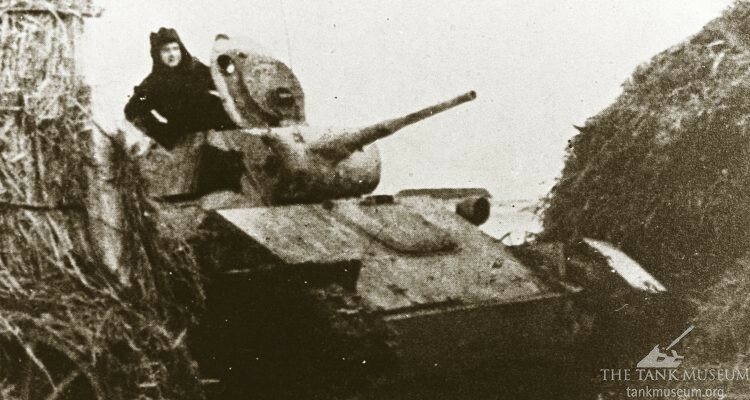 The SU-122 used the T-34 chassis and was armed with a 122mm howitzer. All three were just entering service in mid-1943, and only around 150 in total were at Kursk (25 SU-152, 56 SU-122 and 67 SU-76). The T-70 light tank made up 1/3 of Soviet tank strength at Kursk. In common with the KV-1, by Kursk the T-70 light tank was also recognised as being no longer suited to the frontline. Its 45mm gun and thin armour were inadequate against even older German tanks. It offered no significant advantages in mobility over a T-34 and its one man turret made it difficult to use effectively in combat, especially by unit commanders who needed to both operate their own tank and command others. All the T-70 really offered over the T34 was ease of production, and as the shortages of 1941-2 passed, even this advantage was fading. Overall a third of the 3500 Soviet tanks at Kursk were T-70s, but in some units this proportion was considerably higher. Like the KV-1, it would soon be withdrawn. By far the most common, and most capable, Soviet tank at Kursk was the T-34. 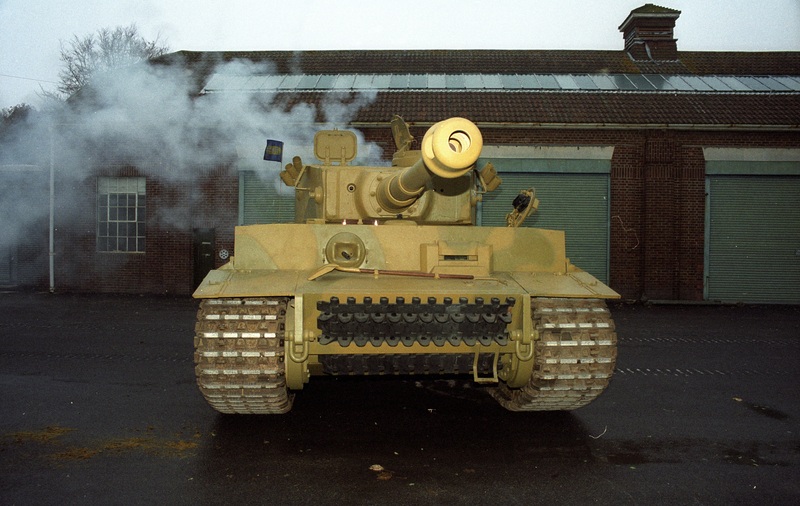 The original version was armed with a 76.2mm gun in a two man turret. By 1943 combat experience had shown both were increasingly inadequate, but the upgunned T-34/85 with its three man turret was not yet ready. 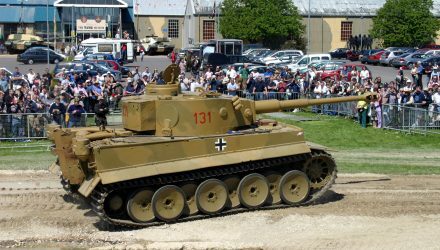 The gun struggled against uparmoured Panzer IVs, and the frontal armour of Tigers and Panthers was essentially impenetrable. Soviet tankers had to brave their formidable firepower in order to get close enough to have any chance of knocking out these tanks. However these new vehicles were in short supply, and the T-34 was still more than capable against most German tanks. 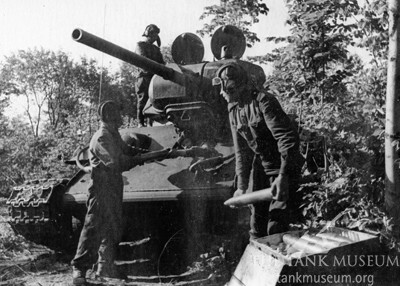 Loading 76.2mm ammunition into a T-34. An area where the T-34 was arguably superior was its mobility. 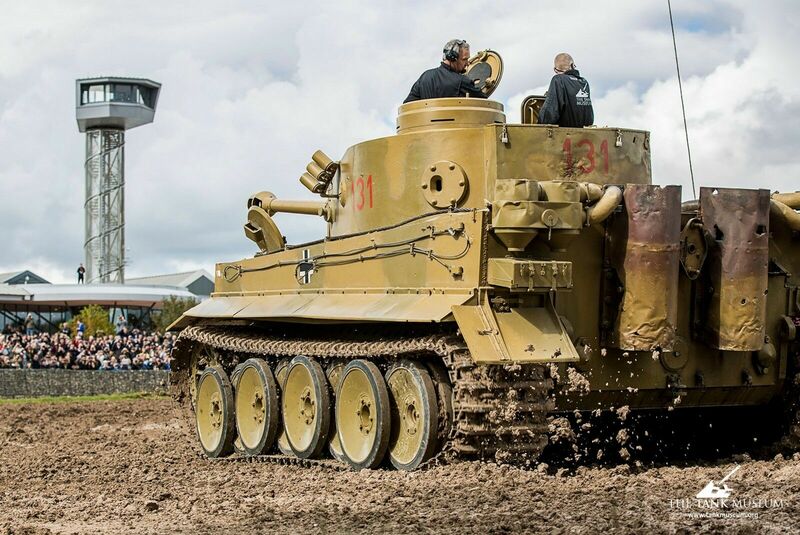 The powerful engine, wide tracks and Christie suspension allowed it to cross terrain other vehicles couldn’t, giving the crews a greater chance of surviving the rush to close in on the Germans. A major weakness for the Soviets was crew training. Matters had improved since late 1941 and early 1942, when the Red Army had been essentially rebuilt from scratch, but it was still a hugely inexperienced force that had no choice but to use simple equipment and simple tactics. However it’s important to remember that these simple Soviet frontline tactics were backed up by increasingly sophisticated higher level strategy. Senior officers were gaining experience and becoming able to prepare complex defences and co-ordinate large combined arms counterattacks. The Red Army was learning how to win the war. 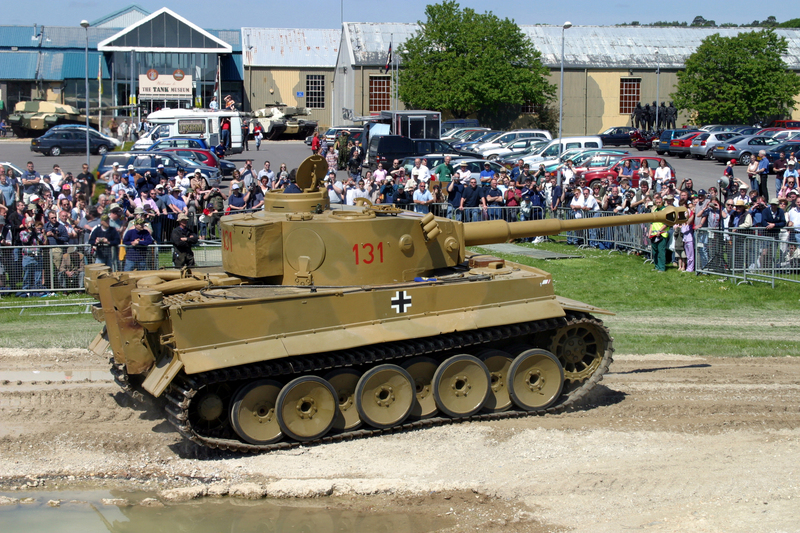 Find out about the Soviet counterattack here and the German tanks used here. The article doesn’t mention the Soviet Tank Destroyers – such as the SU-152. See the last two paragraphs in the section about the KV-1. I know they were obsolete by this point in the European theatre but any record of the number of Stuart Light Tanks at Kursk. I saw one report of 75 going in, probably none coming out. They had some Shermans as well. All part of the early Lend-Lease. Just looking for information regarding the Stuarts as I am with the Stuart Tank Memorial Association, Berwick, PA.